In Michigan, adult criminal misdemeanor cases are handled in the district courts. Felony cases always begin in the district courts but may be moved to the higher court (circuit) after Preliminary Examination unless a resolution can be achieved at the district court level (example: reducing a felony to a misdemeanor). Sentencing up to a maximum of 1 year in jail and 2 years probation. Felonies through preliminary examination but not trial. Small claims lawsuits up to $6,000 (increased to $7,000 in 2024). There are 105 district courts in the State of Michigan. Only the Grosse Pointe Communities continue to maintain municipal courts in the State of Michigan. The geographical location and the number of judges approved for a district court is determined based upon population and the court’s caseload. Districting can change based upon growth and traffic in a region. 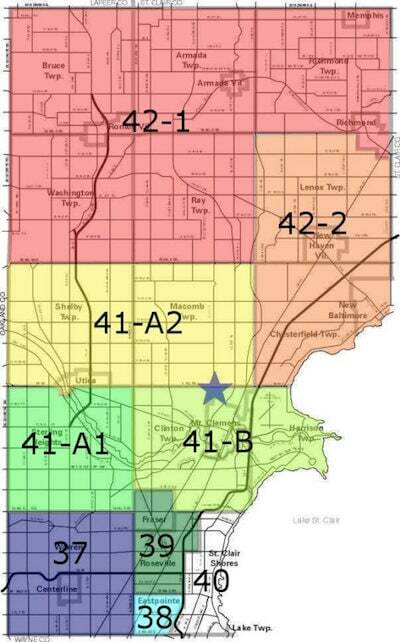 For illustration, the 41-A District Court in Shelby Township has only 1 judge presiding over matters that occur in Shelby Township, Macomb Township and Utica; an area of approximately 72 square miles. Compare this to the 40th District Court in St. Clair Shores which has 2 judges presiding over a land area of 14.28 square miles. As population expansion and court volume increases in geographical areas, additional judgeships and updated court buildings are approved based upon redistricting measures. The 41-A District Court in Shelby Township has already been given approval for a new court building which implies that a second judge may also be approved based upon the growing population in north Macomb County. By clicking a link on the graph below to a particular court and geographical area, you will learn specific information about the selected jurisdiction and corresponding court system. We go a step further by providing practical advice not available anywhere else on the internet if you have a criminal, driving under the influence or traffic matter in any of these courts. Arraignment: First stage where charges are read and bond is set. Arraignments for most misdemeanors can be waived in Macomb County if an attorney is hired and files the necessary documentation with the court beforehand. Pretrial Conference: The pretrial conference is a crucial stage of criminal process whereby negotiations between criminal defense lawyer and prosecutor. Plea Proceeding: If a plea bargain is achieved, the accused will appear before the judge and enter a plea. Trial: If a plea bargain is not achieved, the accused is entitled to a trial pursuant to the 6th Amendment of the United States Constitution. Probation Investigation: Following a plea, or guilty verdict, the court may refer the matter to the probation department for an investigation, report and recommendations regarding sentence. Sentencing: At this phase, the court will read the probation report and listen to any comments by the defense attorney, the defendant, the prosecutor and the crime victim(s). For misdemeanors, sentence cannot exceed 1 year in jail and up to 2 years probation. Arraignment: First stage where charges are read and bond is set. Bond is a huge factor which can be set extremely high for felony cases. Having an attorney at this phase is crucial. Probable Cause Conference: There are many possible moves at this level including a plea bargain to a misdemeanor (keeping the matter in the district court), negotiating for dismissal, agreeing to advance the case to the circuit court, scheduling the preliminary examination. If there is plea bargain to misdemeanor, the plea and sentence will occur in the district court. Preliminary Examination: This hearing may be waived or held. If held and the court finds that there is probable cause to believe the crime was committed, the matter will be bound over to the circuit court for all future proceeings. An experienced criminal defense lawyer knows when it is a wise decision to wavie the preliminary examination or when there are possible benefits by holding it. ABDO LAW is a premier criminal and drunk driving defense law firm that has been based in Macomb County for more than 35 years. Our criminal defense lawyers have represented more than 10,000 clients in every Metro-Detroit Court (Macomb County, St. Clair County, Oakland County, Wayne County). Our clients consist of adults, juveniles that need skillful criminal representation from lawyers with the highest national ratings. In addition, we routinely represent clients from other states and Canada that find themselves in need of an efficient and effective Michigan criminal defense lawyer.